Soo Kim Abboud, M.D. is now an Associate Professor in the Department of Otolaryngology – Head and Neck Surgery at the University of Pennsylvania. She received both her undergraduate and medical degrees from the Johns Hopkins University. Soo is married to an Orthopaedic Surgeon and lives in Philadelphia. In her free time she enjoys tennis, golf, and reading. She now has a daughter named Margo and a son named Joey. Jane Y. Kim, J.D. is an Immigration Specialist at the Children’s Hospital of Philadelphia. She earned her Bachelor’s degree from the University of North Carolina at Chapel Hill and her law degree from Temple University. Jane is married to an educator and lives in Philadelphia, where she enjoys ethnic cuisine, film, tennis, and reading. She now has a young son named Tref. 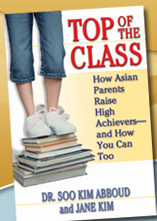 ©2005 Top of the Class. All rights reserved.